Ioannis Baglaneas and his mother, Anna Eves, at home in Rockport. The staff at the Peabody group home where he lived “risked my son’s life for a Sunday off,” Eves said. Ioannis Baglaneas was lonely after his four brothers and sisters moved away to start their lives. 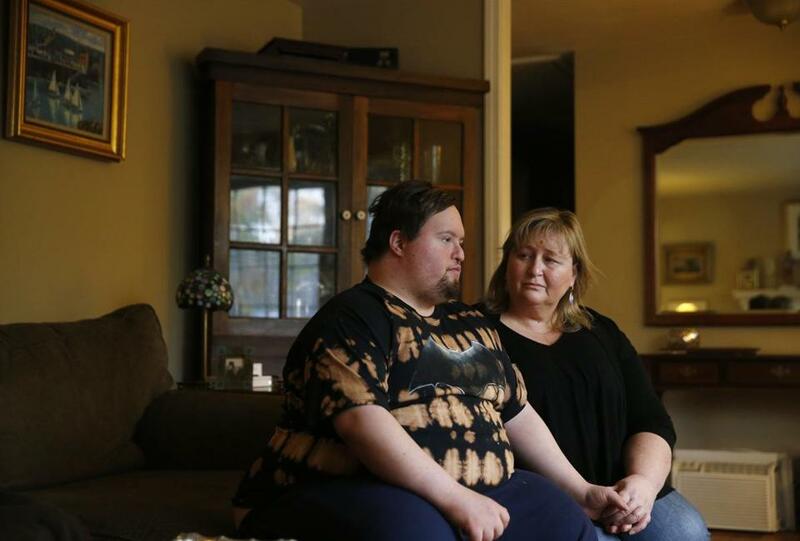 So when his mother showed him the Peabody group home where he would be living with other developmentally disabled adults, he showered her with hugs and kisses. But less than a year later, when Baglaneas, who is 29 and has Down syndrome, developed severe pneumonia, staff members at the home failed to give him proper care. Instead, they ignored his persistent cough and took him to a Special Olympics track meet because the group home planned to close for Easter, which was the following day. When his mother picked him up at the meet, Baglaneas was extremely lethargic, wheezing, and red in the face, an investigation later found. Baglaneas spent more than a month in the hospital, including almost two weeks on a breathing tube in the intensive care unit as he battled respiratory failure, sepsis, and dangerously low blood-oxygen levels. Now, the Essex district attorney’s office has launched a criminal investigation into the alleged mistreatment that Baglaneas suffered at the home, which is run by Bass River, a Beverly nonprofit that operates 11 group homes for developmentally disabled adults on the North Shore. In addition, the commission found one staff member removed documents from the home before they could be reviewed by investigators and told other staff members not to cooperate with the investigation. Bass River declined to say what steps, if any, have been taken in response to the alleged mistreatment and executives would not say if the 7 employees cited for neglect are still working for the organization. The Department of Developmental Services, which oversees group homes, also refused to say if the 7 employees still work for Bass River. The department said, however, that it would make regular visits to the home and review Bass River’s license, which expires in January. “DDS has a zero tolerance policy for abuse and neglect by caregivers, and is committed to ensuring the health and safety of all of the individuals we serve across the Commonwealth,” the department said. The alleged mistreatment apparently began after Baglaneas woke up on the night of April 9, ate a peanut butter birthday cake his roommate had made for him, and went back to bed, according to the Disabled Persons Protection Commission, which compiled a 30-page report on the case. That night, Baglaneas apparently inhaled a piece of the cake into his lungs, which caused him to develop pneumonia, the report said. He probably would not have aspirated the cake, if he had been wearing his CPAP machine, a ventilator which a doctor had prescribed to treat his sleep apnea, the report said. But staff at the home were only placing the ventilator on Baglaneas about 20 percent of the time, and their failure to ensure he was wearing it that night “directly contributed” to his “serious, life-threatening medical condition,” the report said. After Baglaneas started coughing, staff members took him to a nurse, who believed he had bronchitis and an upper-respiratory infection and gave him cold and cough medicine. But the staff did not give him all the doses, nor did they take him to a follow-up appointment, the report said. On April 15, staff members took Baglaneas to run track at the Special Olympics, where his mother found him in the bathroom, wheezing. She took him to Addison Gilbert Hospital in Gloucester, where he was placed in the intensive care unit and given a breathing tube. Eight days later, he was transferred to Massachusetts General Hospital, where he spent another 11 days on a breathing tube in the intensive care unit. After being treated with antibiotics, Baglaneas spent 20 days at Spaulding Rehabilitation Hospital. Eves said her son, who is living at home in Rockport, now has to use an inhaler and take asthma medication. She said she is considering filing a lawsuit against Bass River.